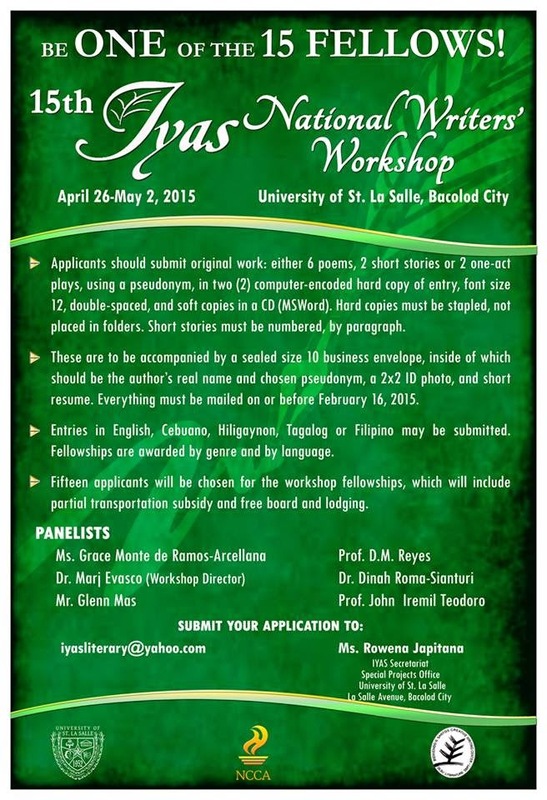 The University of St. La Salle-Bacolod (USLS) is inviting young writers to submit their application for the 15th IYAS National Writers’ Workshop which will be held on April 26 – May 2, 2015 at Balay Kalinungan, USLS-Bacolod. Applicants should submit original work: either 6 poems, 2 short stories, or 2 one-act plays using a pseudonym, in two (2) computer-encoded hard copy of entry, font size 12, double-spaced, and soft copies in a CD (MSWord). Short stories must be numbered, by paragraph. These are to be accompanied by a sealed size 10 business envelope, inside of which should be the author’s real name and chosen pseudonym, a 2x2 ID photo, and short resume. Everything must be mailed on or before February 16, 2015. Entries in English, Cebuano, Hiligaynon, Tagalog or Filipino may be submitted. Fellowships are awarded by genre and by language. Fifteen applicants will be chosen for the workshop fellowships, which will include partial transportation subsidy and free board and lodging. This year’s panelists include Grace Monte de Ramos-Arcellana, Glenn Mas, D.M. Reyes, Dinah Roma, John Iremil Teodoro and Marjorie Evasco as Workshop Director. Please submit your application to: Ms. Rowena Japitana, IYAS Secretariat, Special Projects Office, University of St. La Salle, La Salle Avenue, Bacolod City. For inquiries, please email iyasliterary@yahoo.com. IYAS is held in collaboration with the Bienvenido N. Santos Creative Writing Center of De La Salle University-Manila and the National Commission for Culture and the Arts.